Sadly it was not to be once more for Dagenham lightweight Kevin Mitchell last night – but after a brave and spirited performance – and third crack at a world title – the affable Londoner is left wondering where he can next go from here, with opposing views as to the future of the East London fighter. Mitchell and Linares were always going to be the most intriguing fight on the card for me due to each man’s high skill level and individual frailties – and the bout did not disappoint in terms of action and excitement. The early rounds were close, with both exchanging and enjoying success – although one would be hard pressed to deny Linares the nod – as it were he who appeared slightly busier for the first 6 minutes. A close third was probably Mitchell’s – and as the partisan crowd began to get more vocal – it seemed to roar the Brit on, who began showing more signs of aggression. Pivotal was a 4th round clash of heads, that left Linares cut on the side of his own head – however, more worryingly for Mitchell – he opened up above the left eye and the wounded area immediately showed signs of swelling. Seemingly spurred on by the injury, Mitchell floored Linares in the 5th and looked to be re-asserting himself in the fight. Yet Linares is not a 3 weight world champion for no reason – and he refused to be denied, fighting his way back into the fight after appearing to be hurt himself. Come the 8th, the earlier head clash proved crucial as Mitchell’s left eye looked an utter mess. The cut further opened up due to the huge swelling that by now – had all but closed the eye and rendered it useless. Linares – relentless – kept coming. When he hit the deck in the 10th from a flurry of punches from the Venezuelan champion, Mitchell bravely got to his feet to meet the count but one look from referee Victor Loughlin at the eye clearly told him all he needed to know and the fight was waved off – a rightful and completely justified stoppage. It was a lion hearted performance from Mitchell but at 30 years old, after battling back from alcoholism and numerous out of ring issues over recent years, one must ask if he can come back – despite clearly proving he has the skills to hang at world level. And twitter has been awash with messages of support for him. It will be very interesting what does happen next for Mitchell, who now needs some time away to heal up, rest up and re-focus. Hopefully with the team he has – and his hook up with old trainer Tony Sims – the focus will be the least of his problems. 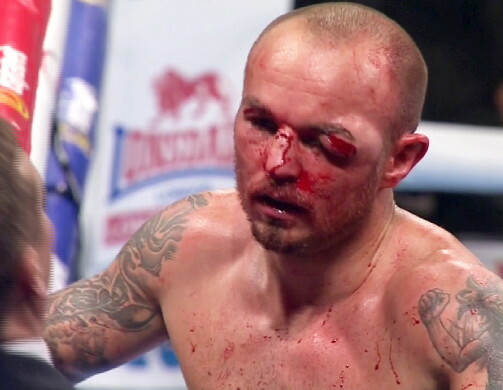 You are here: Home / Boxing News / The Heart Of A Lion : Is There A Way Back For Kevin Mitchell?